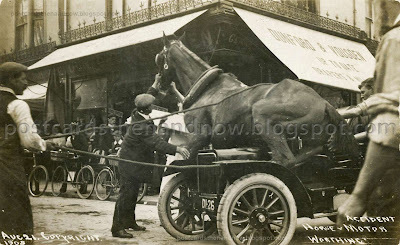 Another oddity for this week's collection, but this one is spectacular - the horse must have been terrified, even if it survived. Great choice. Gosh the car and the horse do look entangled. I hope the horse survived. There must have been quite a number of accidents between horses and cars when both were using the roads. Have you been able to track down a report of this in the newspapers of the day? The horse may have survived the accident, but I wonder if it was able to continue to perform his job and survive in the end? What an interesting photo. It's even more amazing that someone in that time period had a camera handy. Oh I do hope that horse was okay! What a beauty. I hope the horse survived. Poor thing. It looks so frightened. That does not look like a fit horse. Either very old or undernourished. These postcards of train derailments, auto-horse accidents, etc. must have required a rapid response by the photographer to be the first studio on the scene. And who would buy this postcard? Was it ever posted? And what is the overhead grid of wires in the modern streetview? Another great example of an image so full of interest in every corner that you could write a short book on it. Poor horse. This photo would have been a good prompt. This was very hard for me to look at. I can't believe they made a postcard out of this.